Virtual reality has long been the vanguard of the gaming industry, but it comes with its limitations. Namely, how to move around in the game, using real body movements, without actually running out of room in your physical playing area. Omni-directional treadmills seem to be the best solution, but they’re ridiculously expensive and too big to fit comfortably in a normal home. The WizDish is a much smaller locomotion solution that fits in an average-size room and lets you walk all over the virtual playing field without actually moving from one small spot on your floor. It’s about the size of an exercise trampoline, weighs just 14 pounds, and has no moving parts, making it ideal for use in a living area. The dish is a concave surface that exploits the particular methods the human foot uses to keep us upright and balanced. 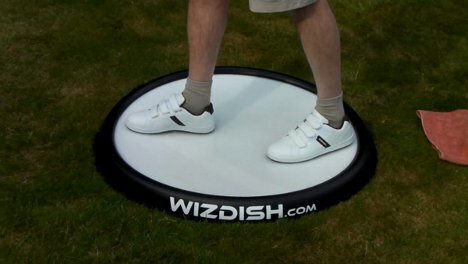 The motion used to virtually walk around on the WizDish is quite similar to actual walking, although it looks more like skating across the surface. No matter what the motion looks like, the device requires moving around – which could be a good way to stem the rising tide of obesity in gamers around the world.